With Rs 64 crore in first two days, will Dangal be able to make it to Rs 100 crore club in first 3 days like Salman's Sultan? After creating much hype post-release, Aamir Khan's 'Dangal' is winning lots of appreciations from the audience. The film has collected around Rs 65 crore after Two days of it hit the theatres. On day 2 after release Dangal collected Rs 34.82 crore while it collected Rs 29.78 crore on the first day of the release. The audiences are finding it hard to resist the movie and are lauding the commendable performances of Aamir Khan and the entire cast. Despite cash crunch due to note ban, 'Dangal' is constantly going hard on demonetization and heading sharply to become the biggest film of the year. Dangal is expected to enter the Rs 100 crore club by the end of this weekend. 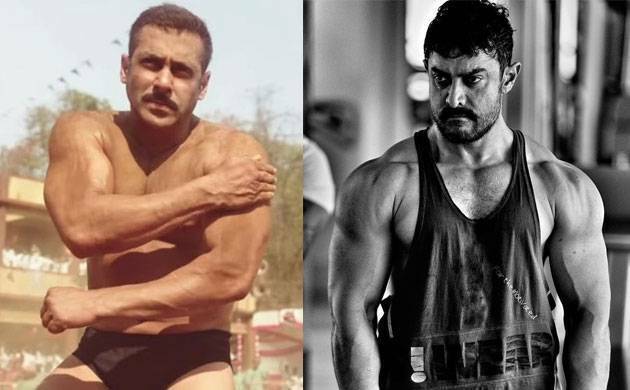 Interestingly, if we go by the box office collections, the Aamir starrer is witnessing a tough competition from Salman Khan's 'Sultan' which too was based on wrestling. In comparison, Dangal has failed to beat the first-day collections of 'Sultan' which earned Rs 36.54 crores on its opening day. But after day 2 collections, it seems like Dangal is moving fast to beat the set of box office records set by Sultan. Film critique Taran Adarsh stressed on the fact that Aamir Khan’s success ratio is 100 per cent whenever any of his film release around Christmas. Taare Zameen Par, Ghajini, 3 Idiots, Dhoom 3, PK and now Dangal, Aamir Khan has been fabulous. #TaareZameenPar, #Ghajini, #3Idiots, #Dhoom3, #PK and now, #Dangal... Aamir Khan's success ratio during Christmas remains 100%. In fact, Sultan made a collection of Rs 180. 36 crore in the opening weekend. However, the movie had a benefit of an extended weekend, given that the movie was released on Wednesday. But after public’s handsome response and critique‘s good review, Dangal might leave behind Sultan in terms of collection. It all depends on how the movie is channelled and how it performs in the coming days. Reportedly, “Dangal” released in 5,300 screens - 4,300 in the domestic market and 1,000 overseas. “Sultan” was released in 5,100 screens - 4,100 in India and 1,000 in the international market. As per reports, “Sultan” was made at an estimated budget of Rs 90 crore, including Rs 20 crore on print and publicity. The budget of “Dangal” is estimated to be Rs 70 crore.